SAN FRANCISCO, CA--(Marketwired - Sep 9, 2013) - Livefyre, provider of the leading real-time conversation and social curation platform, announced the acquisition of Storify, the drag-and-drop storytelling tool that has changed the way journalists and brands tell stories on the web. Livefyre will integrate Storify into its StreamHub platform, combining the two top social curation technologies into the industry's most comprehensive real-time product suite. Founded in 2010, Storify was created to help journalists sift through the massive amounts of social content around news events to create multimedia stories that can be embedded anywhere. As Storify grew in popularity among journalists, marketers and PR agencies took notice and began using the social curation tool to hand-select social content for websites, microsites and advertising campaigns. Storify is now used by nearly one million journalists, agencies and brands to tell stories online, including the BBC, CNN, Al Jazeera, EA Sports, Ford, GE, HBO, IBM, Microsoft, Marc Jacobs, Samsung, The Wall Street Journal and The New York Times. "Acquiring Storify made perfect sense," said Jordan Kretchmer, founder and CEO of Livefyre. "Livefyre powers social media and user engagement on the largest media properties and brands on the web. Storify also delivers a unique and vital curation tool for journalists and editors at many of those same companies. Now our enterprise users will be able to manage Storify content from the same centralized Livefyre dashboard where they're already managing all of their social and user-generated content. With the addition of Storify, StreamHub is now the only real-time platform that enables both editorial and automated content curation from all the major social networks including Twitter, Facebook and Instagram." With over 400 enterprise customers including AOL Tech, Dow Jones/Wall Street Journal, CBS, Conde Nast, FOX News, Fox Sports, Sports Illustrated, Time, Inc. and The New York Times, Livefyre represents a majority of the publishing world. In addition to providing applications such as LiveComments, LiveBlog, LiveChat, LiveMediaWall and LiveReviews, the company recently launched a native ad offering that makes user-generated content available for integrated marketing campaigns. Storify's functionality will soon be integrated into this new offering as well. "Livefyre powers mass-scale social curation for some of the largest media companies in the world," said Xavier Damman, co-founder and CEO of Storify. "Livefyre will provide the technology foundation to help Storify scale to meet enterprise customer demands. 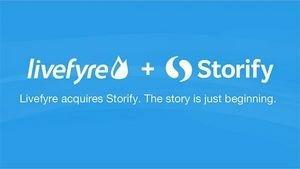 Together, we'll take Storify to the next level and will fulfill Livefyre's vision of powering social everywhere." Storify currently offers three levels of service to its users: Free, Business and VIP. With this acquisition, the Storify Free product will continue to be offered as it is now. The teams will merge Storify's multiple paid tiers into a single enterprise offering that will include additional new features such as single sign-on to create stories, centralized story and editor management, Storify galleries, user participation tools, automated media filtering and engagement analytics. Storify co-founder Burt Herman added: "We created Storify to unite journalism and social media, helping to tell stories that come alive with eyewitness reports from where news is happening. Joining Livefyre means our users, including journalists and now brands and agencies, will be able to integrate social media easily across their websites, and also into mobile apps, ads and TV broadcasts. We can now also help publishers make more revenue through native ads." Both Damman and Herman will join the Livefyre team, along with Storify employees from product, engineering and support. Damman will continue to oversee the Storify product, and Herman will lead relations for all of Livefyre's editorial users and partners. Storify becomes the first acquisition by Livefyre since its founding in 2009. Livefyre helps companies engage consumers through a combination of real-time conversation, social curation and social advertising. With Livefyre, brands can integrate real-time social content into their websites, mobile apps, advertisements and television broadcasts to increase viewer engagement, boost website traffic and drive revenue. As the fifth largest network online, Livefyre is powering real-time social experiences for over 400 leading brands including American Idol, AOL, Bravo, CBS, Conde Nast, Dow Jones/WSJ, FOX Sports, Mashable, NASCAR, Showtime, Sony Playstation, Sports Illustrated, The New York Times and Universal Music Group. Founded in 2009 with offices in San Francisco and New York, Livefyre was named one of the best places to work in the Bay Area by the San Francisco Business Times. For more information, visit www.livefyre.com or follow us Twitter and Instagram at @livefyre. Storify is the leading social storytelling platform, enabling users to easily collect tweets, photos, videos and media from across the web to create stories that can be embedded on any website. Storify is used by tens of thousands of publishers each month, from individuals to major media companies including The Wall Street Journal, Al Jazeera, The New York Times and CNN; major government and non-profit agencies including The White House, U.S. State Department, the British Prime Minister, the United Nations; brands and agencies including Porter Novelli, HBO, Ford Motor Co., Neiman Marcus, Microsoft, Hilton, Vivaki and Code and Theory; and educational institutions including Harvard, Stanford, UC Berkeley and Duke University. Since its founding in 2010, Storify has been honored with many awards for innovation, including the top social media prize at the SXSW Interactive conference and the Online Journalism Award for digital innovation. Storify was also part of a winning Pulitzer prize entry for breaking news reporting in 2013. Read our blog at http://storify.com/storify or follow us on Twitter at @Storify.